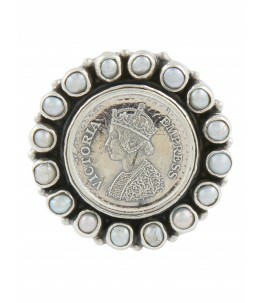 A lovely antique earring to add to your collection. This beautiful earring is embedded with ruby coloured stones to make you feel royal. It has 7 coins placed in a beautiful overlap. This beautifully handcrafted earring is perfect for any outfit you wear. This earring is made in pure 92.5 Sterling Silver which is the highest proportion of silver that can be used to make jewellery.